Julia, Julie, Jules, JC, Julienne, JoJo, Jane…. We are the J’s of BEST EVER….. It all started when Julie made a cookie cake for Owen’s birthday! It was BEST EVER! GrandMoomie (i.e. Julia) took one bite and had to have the recipe! As it turns out, it was from the New Best Ever Recipes from Cook’s Illustrated 2004. And the game began! Julia ordered the OUT-OF-PRINT book! Angst….. she ordered the wrong one! She got the ORIGINAL …… the 1999 Best Ever Recipes from Cook’s Illustrated! So she quickly Amazon’d it again so they could “cook together”! And that’s what they did. Each would try various recipes from the cookbook and post a picture and give a critique. Word spread……. Jules hears about the game and wanted to join! Gotta buy the book! And she did! So Philadelphia Jules is now cookin’! Next to join was Julia’s best ever neighbor….JC! Gotta get the book….. and she did! So now she’s cookin’! Next to join was Julia’s best ever Burger Monday friend, Julienne (as in fries). Her book is in transit and she is coming on board to bake! And then there’s JoJo! Little JoJo (i.e. “no colon – still rollin’!”) has also ordered the book! We can’t wait for it to come and for her to start making out her weekly menus! She’s quite disciplined and will raise our game!! And now Jane joins ranks!! 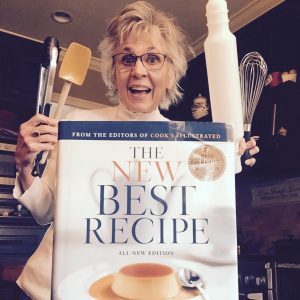 Jane is Phyllis Jane, sister of Julia, and she got her Best Ever Cookbook for her birthday! Welcome!! Let’s all get to cooking! Ours is a simple little baking club. It goes like this…. From Book ~~~ To Cook ~~~ To Look! You gotta get the book, then you cook whatever you choose, then you post pictures of it along with your critique! Done! Fun! And guess who says “WON”….. our husbands, who are the benefactors of all this cookin’!